The Georgia Ports Authority’s mission is to empower entrepreneurs, strengthen industries, sustain communities and fortify families by relentlessly striving to accelerate global commerce. 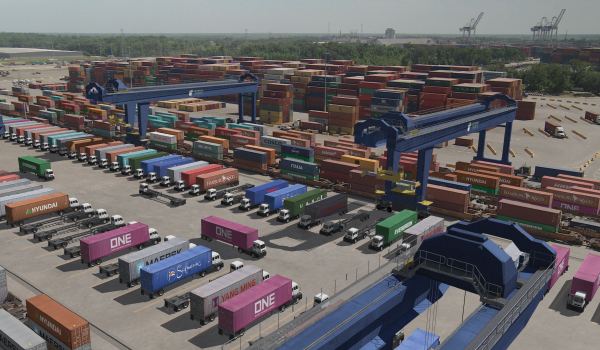 The Port of Savannah is the Southeast’s busiest intermodal gateway. However, the Georgia Ports Authority is making a series of infrastructure improvements that set the stage to capture greater market share. Key to expanding rail service is a $128M project linking Garden City Terminal’s two rail yards. The project, dubbed the Mason Mega Rail Terminal, will allow GPA to build additional 10,000-foot long unit trains on terminal without disrupting nearby traffic. Set for completion in 2020, the rail expansion will improve efficiency and double terminal rail lift capacity to 1 million containers per year. Unit train capacity on terminal will build density into the system, and enable rail providers CSX and Norfolk Southern to deliver faster, more frequent rail service to markets along the Mid-American Arc from Memphis to Chicago and the Ohio Valley. From ship to shore to on-terminal rail, the speed and efficiency of GPA’s intermodal services are unmatched. With the addition of the Mason Mega Rail Terminal, service to Mid-American Arc cities becomes more competitive. GPA already features 25 trains per week to and from Mid-American Arc locations. Unit train capability will provide a new option, delivering reliable, consistent access to the Southeast and Midwest. Savannah currently offers the fastest westward transit times in the South Atlantic region, including overnight service to a five-state area – Alabama, Georgia, Florida, North Carolina and South Carolina. Port of Savannah customers moving containers by rail enjoy superior speed and reliability, with most cargo moving from vessel to rail within 24 hours. Savannah is just over 1,000 miles from Chicago by rail – comparable to other ports that are north of Savannah, but also farther east. Savannah rail providers Norfolk Southern and CSX Transportation provide double-stack container trains along the entire route between Savannah and the Midwest. Congestion-free movement from ship to rail cuts expenses and speeds delivery directly to the customer. As the first port of call on many Panama Canal shipping services, the Port of Savannah provides additional assurance of on-time cargo arrival.